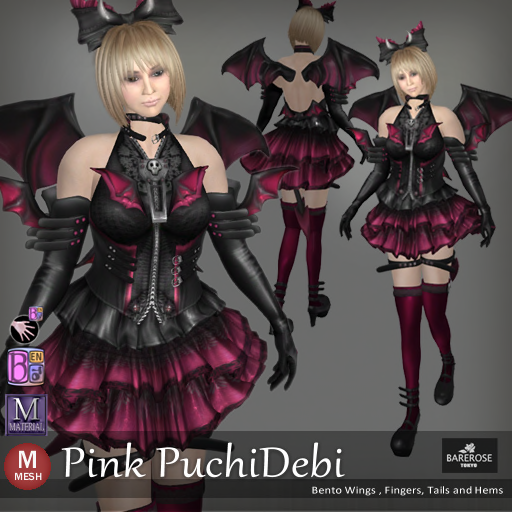 The Pink PuchiDebi is a mesh material outfit from Bare Rose that resembles those little cute vampire girls in anime and games. In additional, this also supports the new Bento systems with wings, fingers, tails and hems. Here is a nice side view of the outfit and you can see the cute wings not just on the back but on the elbow too. There is also a small little Bento tail that comes with this outfit. From the front, you can see the details of this outfit is really good because it is material and as usual, all the nice weaves and ribbons are fantastic from Bare Rose.